Adventure Cruise and Sail - Southern Cross Sailing Adventures specialise in overnight sailing holidays. Sail and dive the beautiful Whitsunday Islands and Great Barrier Reef Marine Park on one of their fully crewed sailing holidays. Choose from activities such as swimming, snorkelling, diving, taking a guided island bush walk with one of their eco certified tours or simply relax on the beach. The fleet offers a choice of Adventure Sailing holidays for the 18 to 35's with daily departures, Tall Ship and Deluxe Cruises, which operate in three and four star markets and offer tours for families to couples of all ages. All tours include freshly prepared meals. Join them on one of their two day two night Maxi sailing tours around the Whitsunday Islands. Choose between British Defender, Broomstick, Boomerang or Condor. Vessels are 83 feet long by 20 feet wide. Accommodation is open plan double and single berths. If you are up for a good time, and would like to meet other travellers then this tour could be just for you. With the Maxi's sailing pretty fast, you will get to see more of the Whitsundays in two days, including a visit to Whitehaven Beach, a guided walk to Hill Inlet Lookout, plus sail to the Northern end of the Whitsundays, around Hayman Island, Hook Island and Langford Reef where the most amazing coral reefs are located. Snorkelling on the Reefs is included. Australian Tallship Cruises - Explore the Whitsundays aboard this famous Tallship built in Holland in 1902. Solway Lass has an amazing history, serving in the World Wars for both sides, and at different stages of her life has sailed in: Holland, Germany, England, Scotland, Ireland, Denmark, Fiji and Sydney Harbour. Since the 1990s Solway Lass has been lovingly maintained and today is in exceptional condition, with 10 air-conditioned guest cabins and a licensed bar and saloon. Solway Lass has 11 sails and guests are welcome to help, or relax and take in the unspoilt Island views. This tour is also available as a six day six night itinerary. Note the six night option consists of two three day three night cruises. Solway Lass had an interior refit in May 2018, guest cabins: two double/twin with en suites, one six share; three four share; three Double/Twin; one Double with share bathrooms. Guests joining a cruise on Solway Lass can go snorkelling on Coral Reefs, take an excursion in their glass bottom boat or use the standup paddle boards. Their crew also offer guided island walks to spectacular lookouts and they visit Whitehaven Beach. Have you ever dreamed of Sailing in a Sydney to Hobart Ocean Race? Well here is your opportunity to join in one of Australia's premier yachting regattas, and become part of a Maxi Crew for Hamilton Island Race Week. They have put together a Nine Day Package for guests who want to really be apart of the action of Hamilton Island Race Week. No experience is necessary, as a Package includes a few professional crew, however, by the last race they are pretty sure that guests will be looking like seasoned professionals. Please email enquiries. Choice of Day Tours around the Whitsunday Islands. Tours are suitable towards 18 to 35s, families and young at heart travellers looking for a small group adventure around the Whitsunday Islands. Southern Cross provides a day sailing experience on an America's Cup Racing Yacht, or Whitsunday Bullet provides a power boat tour. Both explore the Whitsundays, including two hours at Whitehaven Beach, plus snorkelling excursion. Plus guests will enjoy a guided island walk to the spectacular Hill Inlet Lookout. Guests on Southern Cross are welcome to get involved with the sailing, have a turn on the wheel, or just sit back and relax. 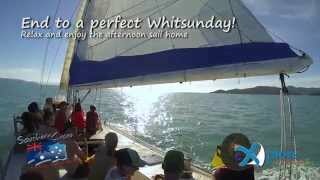 Guests on Whitsunday Bullet feel the wind in your hair as we power around the islands. Bathrooms are available on both tours. If you are travelling on a budget, or have limited time, their two day one night sailing adventure aboard a Maxi Racing Yacht may be just for you. The vessels have been extensively refitted to accommodate up to 23 guests and two crew in open plan accommodation, double or single berths are available. There's also a large saloon/dining area downstairs, plus a large fully shaded cockpit on deck. These Maxi Yachts still sail fast, so they can get to the islands quickly, which means guests get to see more in just two days. Visit Whitehaven Beach, plus sail to the northern end of the Whitsundays for snorkelling. Guests are welcome to get involved with the sailing, have a turn on the wheel, get that terrific adventure photo, or just lay back and take in the scenery as they sail by the Whitsunday Islands.